Editor-in-Chief & Creative Director Cat van Maanen runs Conker Magazine alongside her team as part of the Wildabout Collective. 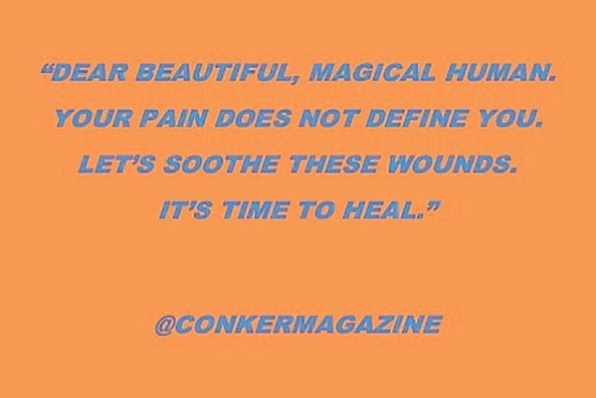 Conker is curated by survivors for survivors in the hope to destigmatise these experiences, providing our audience with a place of purging and healing. Conker is a powerful and empathetic community that gives those affected by a wide range of experiences the kindness, understanding and space they deserve; with themes relating to mental health, gender, sexuality, race, ethnicity, body positivity, intersectional feminism and so much more. Conker Magazine publishes two issues per year, and their latest issue (Volume 2 - Rise) has been available since July 2018. The magazine is about overcoming and supporting those who have had marginalising experiences. Each issue is a celebration of the resilience of the human spirit. It’s a safe space. With personal stories, art, poetry, editorials and lots more content, this magazine gives you that little break from the world that we all need from time to time. Purchase the latest issue on the link below.